Rich Razgaitis cofounded FloWater in 2013 on a mission to eliminate single use plastic water bottles and their destruction of the environment. Swanky hotels, fitness clubs, and sporting events were logical places to start placing his machines, which he says offer “crisp, ultra-purified, perfectly chilled water” sourced from the tap. He positioned FloWater systems as luxury upgrades to drinking fountains and water coolers, with H2O so much tastier than bottled water that consumers would be inspired to carry their own refillable vessels. But when word spread about lead-contaminated water in Flint, Mich., and of the bottled water being trucked in, Razgaitis saw a new opportunity to pursue his vision. He donated eight FloWater units for placement in Flint government buildings, police stations, schools, and churches to prove their effectiveness in eradicating between 95 and 97 percent of the lead in water flowing from city taps. A third party lab that tested one unit found virtually undetectable levels of lead in water filtered by FloWater units from a source containing 45 times the EPA limit for lead. Testing is ongoing and FloWater is seeking sponsors to place additional units. To develop a solution, he partnered with industrial design firm RKS and a water purification manufacturer in Korea. After raising a first round of funding in 2013, his team spent 18 months on intensive product development, from ideation to schematics to prototypes, first-run production, full-scale production, and testing with several thousand consumers. Today, a permanent FloWater system sells for $5,000. Leasing costs $125 per month. For some FloWater customers, that fee is no object. An office that was spending $500 per month on Fiji bottled water reduced its bill by 90 percent after installing a FloWater system, Razgaitis says. 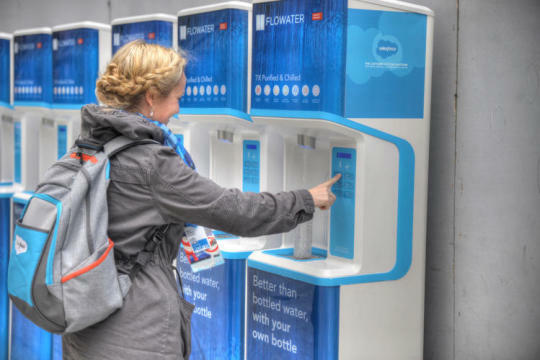 FloWater’s 500 customers, many with more than one unit, have already contributed to saving more than 3 million single use plastic water bottles from the environment, he says. By the end of 2016, he projects 1,000 customers including hotel and fitness chains and school districts. For now, FloWater serves just the B2B market. But consumer requests are common. “We get requests constantly from people who travel to a hotel that has FloWater. They enjoy it all week and then go home and email us a request for a unit.” That’s a product he plans to get into development by the end of 2017. For people in places like Flint, it can’t happen soon enough.